You are here: Home>Archive>Taylor Brown Collection.>Miscellaneous documents and objects.>Attendance register. 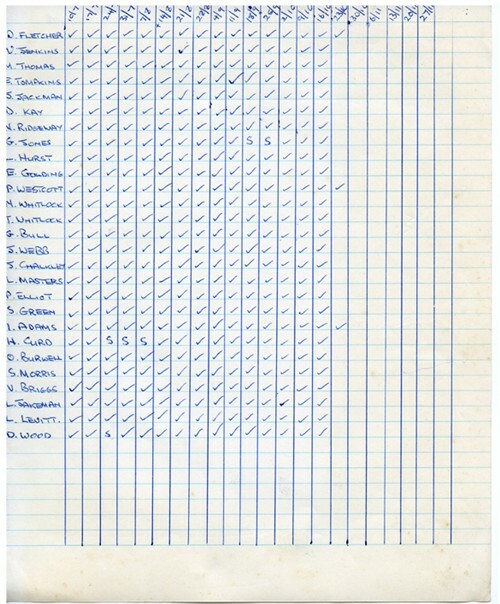 Attendance register with a list of names down the left, dates along the top and ticks to show whether the person was there or not. The register is on lined paper with the names handwritten in blue ink. The vertical lines have been drawn on by hand. The dates go from 10/7 to 27/11 although they are only filled in to 23/10. This is presumably from the Wolverton branch of the Society of Graphical and Allied Trades (SOGAT).